Preheat oven broiler. Place asparagus in a baking dish and drizzle evenly with olive oil. 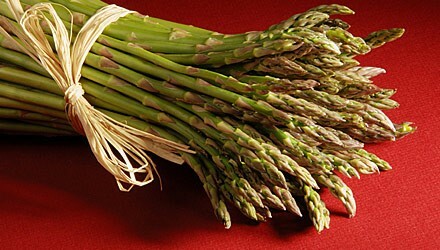 Using a fork, turn asparagus spears over in dish to coat evenly with olive oil. Broil asparagus 4–5 inches from broiler for 4–6 minutes, or until crisp-tender when pierced with a fork; broil with the oven door closed, but keep a watch over cooking process, as oil can spatter. Season with salt and pepper to taste, then sprinkle with Parmesan cheese. Serving size: 1/3 of recipe. Exchanges per serving: 1 nonstarchy vegetable.